mama elephant | design blog: IT'S NOVEMBER, STAMP WITH ME! IT'S NOVEMBER, STAMP WITH ME! Second post of the day! Scroll down to the previous post to read about how we are helping our friend Jennifer McGuire kick off her #sharehandmadekindness campaign. Hurry, the free gift offer ends tonight at 12AM EST! Today we are announcing the winner for October's STAMPWITHME challenge, before we get to that, here is the new STAMPWITHME challenge for November. For November, we'd like to see you create a new card and send it to someone! This will qualify you for Jennifer McGuire's Share Handmade Kindness challenge as well. You can read all about it HERE. Remember to use the hashtag #sharehandmadekindness on Instagram so you can help spread the love! And now to announce the winners for October's STAMPWITHME challenge! It is none other than this super cute and clever card by Keeway Tsao. We love how she stretched the elves from Christmas Spirit and made them useable beyond Christmas! And those mice are from Meowlloween Extras, a Halloween set! She really pulled out many stamp sets for this ingeniously happy card. We love it! Congrats on your win, Keeway! Please email us at mamaelephant.winner@gmail.com with your mailing info to claim your prize of two stamp sets! This card by Elena S is so simple and cute and adorable and a reminder that less is more sometimes! We're always such big fans of Anna Kossakovskaya's work and these two stellar cards shows you just why! It's funny how we started a spinner card rage with our reindeer! 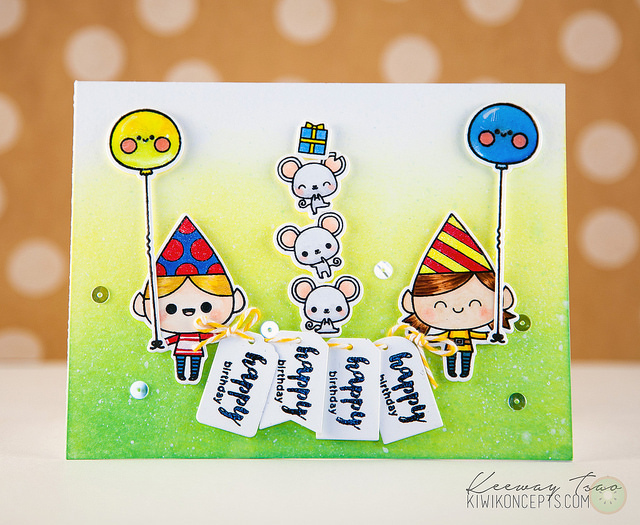 We love Rubz Naz's take on this fun interactive card! THANKS, FOR PARTICIPATING EVERYONE and REMEMBER TO #sharehandmadekindess!!! *jumping up and down with joy*!! thank you ME for this challenge and for creating such amazing stamps! and congrats to everyone! Congrats, Keeway! Really amazing card! And thank you for picking my card too! Yay!!! Btw, when you said to tag the photo, do you mean just put it in the description? I can't seem to tag a photo just like in Facebook or Instagram.